In her new monthly column for AnOthermag.com, curator and director of Soft Opening, Antonia Marsh, considers the work of one contemporary artist. I first came across the work of American artist Jessi Reaves last year at Frieze Art Fair in London at the Herald St booth. At the end of an aisle, I suddenly spotted a giant, patchily painted brown cabinet, festooned with red and pink Harlequin-patterned padding at the most unconventional – and definitely inconvenient – corners. Padded Cabinet (2017) fast became my favourite artwork at the fair and the Herald St staff can testify to my continuous stalking of their booth for the rest of the weekend. I can’t remember if I was more confused or delighted: how unusual to see something at once sculptural and functional at an art fair. Reaves’ practice focuses on this exact conflict between functionality and aesthetics. 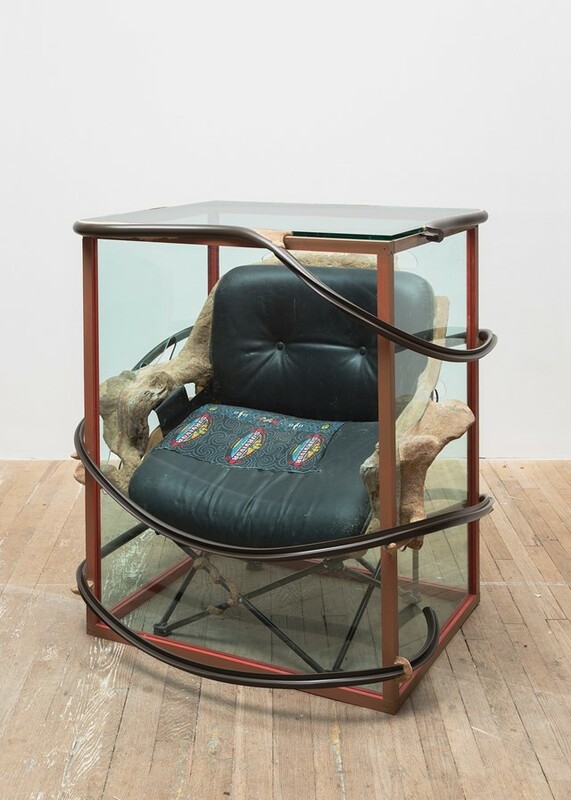 Had I taken Padded Cabinet home with me, I wouldn’t be busy stacking magazines on its shelves – this dilemma, of the functionality of the art object, is at the centre of Reaves’ work. In order to pervert these boundaries of form and function and art versus design, New York-based Reaves repurposes existing furniture into her sculptural constructions. Immediately recognisable, seminal – even clichéd – pieces from Isamu Noguchi, Marcel Breuer, Herman Miller, Charles and Ray Eames and Philip Johnson become raw material as Reaves initiates a process of intervention into Modernist furniture. Deconstructing then reconstructing chairs, couches, tables, lamps and shelving units, the artist playfully distorts the fixed designs of her predecessors into irrational, achingly absurdist and borderline surreal sculptures. Rather than deny the existence of a previous owner, Reaves embraces the history carried by each individual piece she uses. In an interview with Josephine Graf for Mousse Magazine in 2016, Reaves explains the implications of these gestures: “In certain instances I’m more concerned with the ideology surrounding the history of a specific piece, the designer, the time period. In others, I’m more focused on how a particular piece has been absorbed culturally. With that work and certain others I’m interested in a particular aesthetic, how it seems trapped between Modernism and a kind of failed biomorphism. I’m looking for pieces that attempt to interact with classic modernist design, that aim for that type of elegance, and then miss... There’s something psychological about that mistake, about aiming for something and then just missing.” Built upwards and outwards with plywood, foam and glue, in their contrast with the sleekness of her repurposed furniture, these crude components expose her mark and instil each work with a mischievous humour. Stains, scratches and sun-bleached patches all accrue meaning for the artist, who chooses materials that lack durability and fade over time. By allowing them to age just as humans do, Reaves animates her sculptures into life. As swollen, puffy limbs protrude, with their surfaces puckered and pierced, stretched, creased and wrinkled, they lean comfortably into their bodily associations. 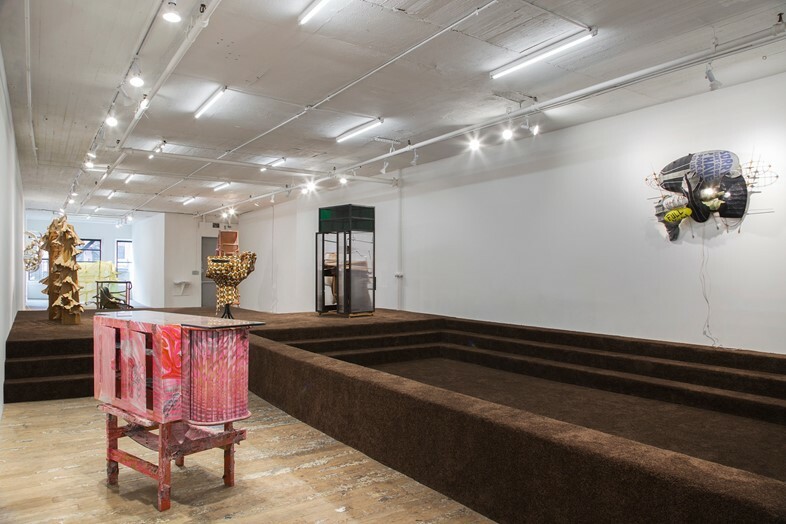 At II, the artist’s second solo exhibition at Bridget Donahue in New York, her sculptures climb across a plush brown carpeted stage. Encouraging the viewer to sit down and have a chat while surrounded by her work, Reaves ensures her work still feels inclusive, interactive and lived-in. Even in their decoration – adorned with lace, beaded curtains and iridescent paint – Reaves’ sculptures feel somehow alive. Unruly, almost baroque detailing repudiates perfection and replaces it with an eccentric charm, like friends glamming up for a night on the tiles, each with their own distinct personality. Mixing sawdust with glue and applying the resulting gunky paste to corners and crannies, Reaves gives these creatures gnarling joints that fuse their composite parts together like overzealous scar tissue. These visceral, anthropomorphic characteristics make me think of the juicy fleshiness in horror movies, or the transformative potential of H. R. Giger’s creatures in Alien. As if magical beasts, if disturbed, these monsters might wake up from a slumber at any moment, stretch out their limbs and scuttle down the stairs, out of the gallery and into the world. Artists seem to be steadily delving into the fantastical realms of the monstrous. A reference to the monsters in charge at the moment? I prefer to propose that this fantasy provides a welcome antidote to the onslaught of doom and gloom consistently enveloping our 21st century experience. II continues at Bridget Donahue, New York until May 12, 2019.